Visiting DC in the Fall? Escape the hustle and crowds of the city to this natural oasis just a few minutes away in Northeast DC along the Anacostia River. You’ll quickly discover a new sense of relaxation as you stroll down beautiful trails and witness a palate of oranges, yellows, browns and reds that have painted the trees and shrubbery. There are historic ponds, aquatic, marsh and wooded habitats where wild birds reside, and a multitude of flowers and a variety of animal species also make this place their home. Guided pond tours are free and available on weekends and entrance to the park is always free. Just minutes from the city, fall fun is underway at the many farms, parks and outdoor venues in the area. The Agricultural History Farm Park in Derwood, Maryland is one that hosts a giant fall festival with pumpkin picking and crafts, scarecrow making, a corn maze, live farm animals, games and food, arts and crafts, live music and much more. The festival takes place in October however, if you can’t make it, this place is still worthy of a visit. It’s a historic farm that dates back to the 1800’s. Found on the property is a vintage barn, farmhouse, saw mill, farm equipment and outbuildings. Kids love petting and observing the farm animals and hiking and riding on the scenic trails. There’s also an orchard with thriving apple crops. Load up the family, pack a lunch and spend the day exploring farm life in the early 20th century. There’s nothing more refreshing than a brisk fall breeze and you’ll feel plenty of them as your ride through the city aboard the open-air orange and green trolley. 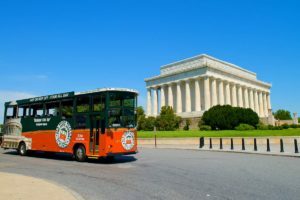 Hop aboard the Old Town Trolley and see all the most significant sites, Washington DC attractions and points of interest. When the trolley stops, get off and take your time exploring. You will be transported to the Washington Monument, the Lincoln Memorial, the Jefferson Memorial, the Smithsonian Museums, the White House, the U.S. Capitol, the Library of Congress and much more. 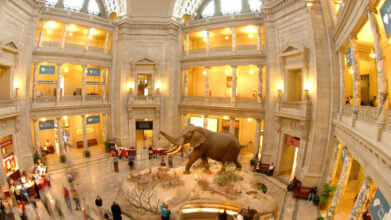 Spend hours touring the Museum of Natural History and the National Air and Space Museum. If you are hungry and like Greek food, stop in at Zaytinya Restaurant right near the Museum of Natural History; it’s well known for its fresh hummus, falafels and a variety of other Mediterranean specialties. Perhaps one of the most moving sights you’ll see while you’re in Washington DC, Arlington National Cemetery is where more than 400,000 service members, veterans and family members of veterans have been laid to rest. The magnificent grounds, rolling hills, trees and gardens make up 624 acres and create a peaceful ambiance and is where nearly 30 funerals a week are still held on a yearly basis. On the Old Town Trolley Tour, catch their exclusive Arlington National Cemetery Shuttle and spend some time touring the grounds. If you’re there during the changing of the guards, which takes place every hour on the hour from October through March, you are in for a stirring spectacle. The uniformed guards perform a poignant ritual in tribute to the fallen soldiers buried here. Come for the museums, monuments and memorials and stay for the many enthralling sights and attractions. Washington DC in the fall beckons you to enjoy an array of outdoor activities and sights.